Teeth, which do not appear when they should, remain under the gums or jaw bones. Which teeth might remain impacted? Wisdom teeth, canine teeth and premolars might remain impacted. If they are not able to be corrected with orthodontic treatment, they need extraction under operation. In which circumstances and when should impacted teeth be extracted? Wisdom teeth are the teeth which are located at the back inside the mouth. Brushing them and their proper care may be rather difficult than other teeth because they are located in an area which is difficult to see and reach. Decaying due to inadequate brushing, wisdom teeth cause pain and bad breath. In certain circumstances, wisdom teeth do not appear due to lack of space in the jaws. Although they may be fully embedded inside the jaw (invisible because under both the gums and the jaw bone), they may partly erupt and become parts of the oral environment. 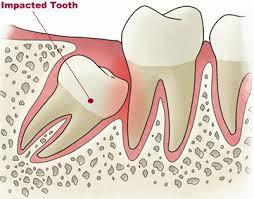 In this case, they may cause infections by triggering food accumulation and food stuck in the area where tooth erupt. This case, which causes swelling and redness around the wisdom teeth, acute pain spreading to the neck and the ear, lymphatic gland inflammation, and pain when opening the mouth and swallowing, is called pericoronitis. Fully embedded teeth may push other teeth and crowd them. Moreover, they may cause neighboring teeth to decay by putting pressure on them. Wisdom teeth, which are not noticed for many years, may pave the way for serious problems by causing very large cysts inside the jaw. Even when they do not cause any problems, for other teeth to come into right positions, wisdom teeth may require extraction with the purpose of orthodontic treatment. Because of such reasons, wisdom teeth extraction is required under local anesthesia which is performed anesthetizing only the area they are located in. How should oral care and diet be after operation? Within the first day after operation, spitting, brushing the teeth, forceful rinsing, using straws or gargling should be avoided. Within first two days, soft food which has no granules should be eaten. After every food intake and tooth brushing, antiseptic mouthwashes which are prescribed by your dentist should be used. Painkillers and antibiotics (if prescribed) should be used properly. Because it will ruin the treatment process, you should not smoke within 48 hours. Will there be a lot of pain after operation? There will not be a lot of pain after quick and efficient operation and pain formation can be easily under control with mild analgesics. Will my face swell after operation? Cheek swelling changes from one person to another depending on patients’ situations. To prevent cheek swelling, cold compress should be applied within the first 24 hours. Slight swelling is normal and it is necessary for recovery.